The contemporary garden carries a profound connection both to the environment and to the range of activities - relaxing, entertaining, working - that characterize today's lifestyle. A collaboration between a distinguished style setter and a noted garden designer, Outdoors presents the principles of imaginative and innovation design, providing readers with useful knowledge and also with inspiration from diverse sources: history, media, fashion, architecture. Thematic chapters present a wide variety of successful garden developed for specific purposes. Formal urban gardens on rooftops are explored, as are free-form rural landscapes, backyard devised to encourage children's imaginations, and spaces planned primarily for al fresco entertaining. Extensively illustrated case studies demonstrate inventive design on a grand scale as well as the creative detailing that sets one garden apart from another. In these sections, professionally designed gardens are explored methodically to reveal techniques behind planning and layout, planting choices, intended uses, and relation to the larger landscape. A special focus on conservation philosophies addresses wildlife, recycling, and water-wise gardening. Also included are a step-by-step guide to planning a garden, advice on selecting and working with a garden designer, and an extensive catalogue of plants with scientific names, foliage and bloom descriptions, and planting suggestions. 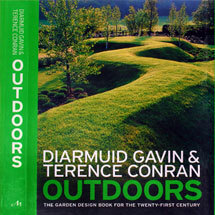 At once practical and provocative, Outdoors is an essential guide to the journey garden design will take over the course of the twenty-first century.